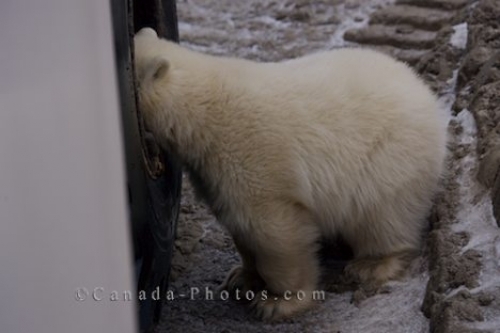 A polar bear cub figures out that his whole head will fit inside the wheel well on a tundra buggy and so he decides to dive in head first to have a closer look around. This is the first year in which this Polar Bear has been able to explore the area on its own but he is still within close range of his mother. Polar Bear, Ursus maritimus, 11 months old exploring a tundra buggy in the Churchill Wildlife Management Area, Hudson Bay, Churchill, Manitoba, Canada. Please let me show you more of my pictures from my "photo gallery: Bear Pictures". Picture of a Polar Bear going head first into the wheel well of a Tundra Buggy in Churchill, Manitoba. Pictures from photo gallery "Bear Pictures"